BALTIMORE (JTA) — Sabina Faynberg decided recently to visit the grave of her cousin Shalom Schwartzbard on a moshav near the Israeli city of Netanya. Going online to find directions, the Jerusalem woman stumbled upon a “Seeking Kin” column that discussed Schwartzbard, who had murdered Semyon Petliura on a Paris street in 1926. Many Jews of the time had held Petliura responsible for instigating pogroms in Ukraine that killed thousands of their relatives and thus believed the killing was justifiable. Shwartzbard, Faynberg knew, was a first cousin of her paternal grandfather, Shmuel Tzvi “Herman” Schwartzbard. The column’s focus on Tamar Dagan’s search for her own Schwartzbard relatives meant that Faynberg had inadvertently discovered another cousin – someone she never heard of but who lives in a bordering neighborhood. So Faynberg contacted “Seeking Kin,” and the column connected Faynberg and Dagan. The two spoke by phone last week and hope to meet soon. Faynberg took the opportunity to tell of her own search — for cousins related to her father’s mother. In the late 1950s, the cousins moved to Israel from Stettin, Poland. The mother of the household was Malvina, nicknamed Manya. She was married and had at least three children, of whom one was known to be a boy and one a girl. Faynberg doesn’t know Manya’s married name, her husband’s first name, the children’s names or where in Israel they settled. She is sure only that Manya’s maiden name was Kern and that Manya’s mother was Leah (nee Uran). Faynberg never met Manya, but she remembers Manya’s brother, Karol or Karl, known as Lolek. In the late 1950s, Lolek and his wife, Pesta, visited the Moscow home of Sabina and her parents, Yakov and Asya Schwartzbard. The Kerns had stopped off on their way to visit Manya in Israel – and later would settle there, too. 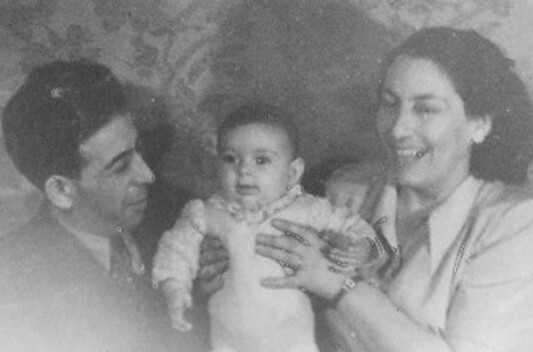 On the back of the photograph that shows her and her children (the one accompanying this column), Manya had noted that the image was taken in 1956 in Stettin. Faynberg surmises that the picture was made as a keepsake just before the family left for Israel. According to a family history that Yakov wrote for Faynberg’s son, Moshe, the Kerns lived in Stanislavov (now known as Ivano-Frankivsk, in western Ukraine), as did the entire Uran and Schwartzbard clans. During World War II, Lolek, Manya and their parents escaped to Tashkent, Uzbekistan. The siblings’ brother, Saleh (perhaps a diminutive of Solomon, Faynberg thinks), remained in Stanislavov and was killed in the Holocaust. So, too, were Faynberg’s paternal grandparents, Herman and Sabina Schwartzbard. Sabina Uran Schwartzbard, Faynberg said, had five siblings: three sisters and two brothers. Besides Leah, they included Samuel, who moved to Switzerland and died, childless, before World War II; Pinya, perhaps short for Pinhas, who was a Stanislavov businessman and lived in a big house; and two sisters whose names Faynberg does not know. One sister had a son, Haim Frish, who moved to Sao Paolo, Brazil. As happened with Dagan, Faynberg is hoping the names and places will spark a connection in the minds of readers who are long-lost kin and will help reunite her with them. Faynberg and her husband, Vladimir, have Moshe and his wife and four children living nearby in Jerusalem. Moshe making aliyah in 2002 from New York, where the family lived in the Bayside section of Queens after emigrating from Moscow, spurred Vladimir and Sabina to move to Israel, too. Whether or not Moshe has more children, Faynberg would like to add more people to her family tree. “I don’t have many relatives, especially on my father’s side,” she said. Another who fortuitously came upon a recent “Seeking Kin” column is Joseph Long, a retiree from Cleveland now living on St. Simon’s Island in Georgia. Long wants to get the word out about a reunion of Polish children who were sheltered during part of World War II in the estate of a maharajah in India. A “Seeking Kin” column last summer told of one of the 12 Jewish children from Poland known to have been relocated temporarily to the estate, known as Balachadi. Francis Pluta, Long’s great-uncle, was the priest who was in charge of the children sheltered there. Reunions of the overwhelmingly Catholic group are held every two years in Poland. Next year’s reunion likely will be held in London, since a good number of the children — many of them orphaned during the war — would later settle in England. At one of the recent reunions, participants decided to make the 2014 London gathering their last because of the age and infirmity of many of their number. Some of those sheltered at the India estate — Long isn’t sure how many — now live in North America. That’s why Long, who is not Jewish, decided to arrange a reunion. He came across the column and asked for the help of “Seeking Kin” in spreading the news about the Aug. 3-4 event at the Orchard Lake Seminary, near Detroit, where he hopes the names can be recited of those children who have since died or are unable to attend. Long is organizing the gathering because he feels a personal connection to the children’s group because of Pluta, the brother of Long’s maternal grandfather. “I think that if he were to be asked, would you want a reunion to be organized of these orphans at the twilight of their lives, he would want that,” Long said of Pluta, who died in Ontario in 1990.